Detective travel of Professor Kamami Izumi | Digitalestate Inc. Professor Izumiko studying folklore studies at a girls’ university in Nagoya goes on a research trip with female students, but he is involved almost always in a strange incident on that journey. The stage of the incident centered on Kanazawa, Kamakura, Saint-Germain-en-Laye (France, suburbs of Paris), elsewhere. Especially when studying the culture and history of Kanazawa as a foothold of his second house there, he gets involved in some kind of incident. Should we say that it is a case book rather than a research record ? Since March 2015 when the Hokuriku Shinkansen was opened, the interest in Kanazawa has been much more increasing than before. I would be pleased if you would like to explore various cultural backgrounds with Professor Izumi. Author Takahama Mako is a mysterious person, apparently I know that Professor Izumi seems to be involved. 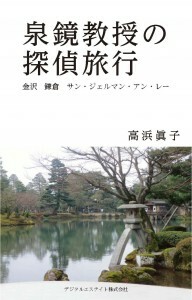 Detective travel of Professor Kagami Izumi; Kanazawa, Kamakura, Saint-Germain en laye e-book version released. Please enjoy “Detective travel of Professor Kamami Izumi” in preview. When you click the icon below, to jump to click the site of the reader.